Forget Frying Them!! We’ve Got A New Way To Make French Fries!! Is there anybody who doesn’t like french fries?? Hopefully not, since they’re our favorite indulgent snack…seriously, it’s impossible for us to have just one! 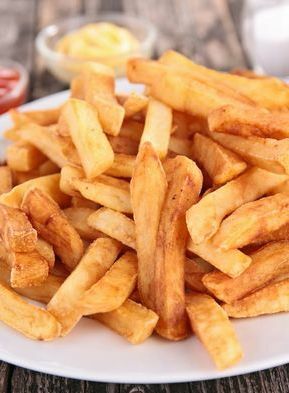 Unfortunately, french fries don’t quite fall into the “health food” category, so we try not to have them too often, thinking there were no alternative ways of getting those thin strips of potato goodness into our bellies – but we found another way!! That’s right, throw your potatoes in your slow cooker, rev em up to high heat and you can have non-fried french fries in just a few hours! They taste amazing – especially with the seasoning we gave them – and they’re way better for you than the real deal. Does it get any better than that?! In a small bowl, whisk together the olive oil, garlic powder, onion powder, chili powder (if using), and salt and pepper. Place your fries in the slow cooker insert and pour seasoned oil mixture over the potatoes, then toss to coat everything thoroughly. Turn slow cooker on HIGH and cook for 2 1/2-3 hours, stirring every hour, or until potatoes are fork tender. Note: begin checking potatoes at 2 hours to make sure they don’t over cook. Remove fries from slow cooker and serve hot with ketchup or mustard.